Emma Wright is our independent designer of the week and the winner of our Britain’s Next Top Knitwear Designer competition. We’re all in love with her adorable patterns, and with her flair for funky, fashion forward knits, we can’t wait to see what she designs next. Click here to browse Emma’s patterns. Hi Emma! Thanks for letting us pick your brain today! Can you tell me about yourself, how you started knitting – who or what inspired you? I learnt to knit in the traditional way – my Nan taught me when I was a little girl, only I had no interest until I went to college at 16 to study Fashion and Textiles. One of the projects during my first year of textiles was hand knit, so I bought my first knitting book and all the skills my Nan taught me as a child came flooding back. I also taught myself to crochet and machine knit too! When I begin any design project I like to start with a story or design influence I can connect with or that works with my person design style – there are nearly always floral influences in my work and I have a major addiction to Pinterest which is a great place to store inspirational images and ideas. Tell us, Emma – what was your first knit? My first knit was during college, I made a 1960s inspired shift dress with a peter pan collar. I never do things in half measure! It was black, only garter stitch but I had never done shaping for a neck or armholes before so as you can imagine it was a journey! My first ever non-education knit was a Rowan cardigan designed by Martin Storey which I was actually wearing when I met him at a campaign for wool event a few years ago. How has your knitting journey progressed? Where did you study, how did you decide which direction to take? When I was at college my tutor wanted me to push my skills in knitwear and sent me in the direction of Nottingham Trent University where I did my degree in Fashion Knitwear and Knitted Textiles. My graduate collection was one of the hardest but most satisfying things I have ever done, I worked day and night to complete it and I am so pleased with what I have achieved. Inspired by my home county of Yorkshire, beginning with the countryside, sheep and my love of tea as well as a play on feminine stereotypes I designed a collection of 6 outfits celebrating my love of handmade and British manufacture. I was very lucky to have my collection sponsored by Rowan, Laxtons and Erika Knight who all made my dream of a 100% British wool collection happen. What are your most treasured yarns and styles – what are you knitting right now? I’m a big supporter of British Yarns, Erika Knight’s yarn collection is beautiful and West Yorkshire Spinners Signature 4ply is another favourite yarn of mine. Of course, I am a lover of Louisa Harding’s yarn, I get very excited to see Louisa’s newest yarns or new shades that are added to existing yarns. At the moment I am working on a few different projects, I am juggling as usual. One project is a design which featured in a knitting magazine at the end of the year  using one of my favourite yarns, Louisa Harding Akiko paired with Luzia. The second is a jumper using Rooster Yarns Merino DK, another very beautiful yarn to work with. How have your experiences influenced your design style? During my third year of University I was a design Intern at Thomas. B. Ramsden and also did a small placement with Louisa Harding. That year I gained the freedom to build my own design identity and begun having my designs published by some very wonderful magazines and design companies. Louisa is amazing, I love working with her. She is very inspirational and I am very lucky to work with her so closely. I did a small placement with Louisa during my third year at university. Louisa took me through the processes she takes to prepare for a photo shoot I was over the moon when she asked me to be her design assistant. We went to Pitti [Immagine] looking at new yarns for autumn and winter 2015 which was an exciting but slightly overwhelming experience. Can you tell us about the garment that you designed, for our Britain’s Next Top Knitwear Designer competition – what was the inspiration behind it? I knew that I had to design something wearable but creative to fulfil the brief of the competition and I really wanted the design to have my stamp on it, I have a slight obsession for bows and was feeling quite inspired by the idea of rough and aged textures. The great thing about this garment is how versatile it is, you can wear it with the bow at the front, at the back or with the bottom hem of the back sewn up for a structured garment. The maker can also personalise this garment by changing the contrast colour or keep a natural look. How has winning the competition changed your direction? Winning the competition was an amazing surprise. I come from a university that encourage live projects and competitions but I have never won anything like this before. I think winning a competition like this is encouraging, it helped me to really believe in my work and has given me a brand new insight on how to approach any project I face. Winning the competition has opened many new doors for me and I am looking forward to what it brings in the future. Aside from my commissioned design work, I am currently putting together a mini collection of PDFs which I am quite excited about. It’s inspired by my three favourite things, sheep, flowers and British wool. I am hoping that these patterns will be available here at LoveKnitting in time for summer! To shop Emma Wright’s downloadable PDF patterns, click here. Inspired to sell your own knitting patterns? 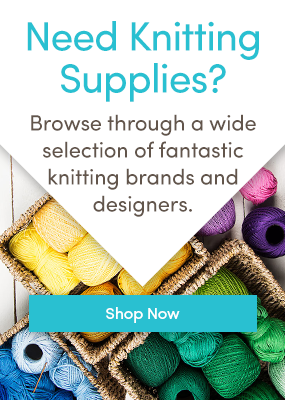 Visit LoveKnitting Designers to find out more.